Note: The strict weight limit on your internal flights will be 44 lbs (20 kg), not the 50 lbs that you may be used to internationally. If you prefer to only bring a carry-on, you’re welcome to do that, as well. Although more and more South Asians are adopting Western wear, traditional clothing is very prevalent and modesty is the name of the game. Please do not wear clothes that are tight, transparent or show too much skin or underarms. This means no tank tops or mid-riff baring tops. We also discourage wearing form-fitting “skinny” jeans and shorts/skirts above the knee. Instead, we recommend wear loose fitting clothing such as long skirts, pants, capri-length pants, and blouses or tunics. 3-5 pair pants or long skirts. You may want to bring leggings or long johns (2 or 3 pair) to wear under your long tunics, skirts or pants on chilly mornings or evenings (again—it’s all about the layers!) Fleece pants might be nice, and good to sleep in during chilly nights. A thicker sweater or jacket for cold Bhutan mornings and evenings. A windbreaker or shell might prove useful if your jacket doesn’t protect you from the wind or rain. Walking sandals (such as Teva’s, Chaco’s, or Merrell’s) also work very well. Note: In Bhutan, you must wear long sleeves and long skirt/pants (ankles must be covered) inside religious sites. In many religious sites you will also be required to remove your shoes. Take thick long socks to cover your ankles, which you will appreciate on the often-cold stone floors. Good sunscreen. Lauren prefers mineral-based ones: good for you, good for the environment. How do you know if it’s mineral based? If the active ingredient is either titanium dioxide or zinc oxide—that’s it. MyChelle and Devita make good ones. Toiletries (shampoo and soap are provided at the hotels, but rarely conditioner). Enough of any prescription drugs you need, as well as over-the-counter needs. Paying by Credit Card or PayPal balance: You can pay with credit card or PayPal balance through the following the red buttons below. Please click the appropriate amount to be taken to PayPal’s homepage to complete your transaction. All PayPal transactions must be in USD. Note that you do not have to pay with your PayPal balance, but can pay with any debit or credit card. Click here for further instruction. Final installment due on August 20, 2017. We’ll provide you the amount and invoice via PayPal before the due date. We have a great new system for some of our international guests which can save a lot of money on currency conversion fees. We LOVE TransferWise! (Click here for our post about them). They are a reputable company and have the lowest fees around for moving money internationally. If you use our link to sign up, you actually get a discount on your first transfer. PayPal charges you 2.5% on top of the current exchange rate (in addition to the 3.9% fee it charges us). TransferWise uses the current exchange rate and only a small fee. Click here to see if TransferWise supports your home currency. In Rishikesh, you will experience meaningful classes with teachers at local ashrams in this holy city along the Ganga. In Kathmandu, you’ll enjoy classes with a local teacher who will come to you in your garden guesthouse. In Bhutan, you’ll be under the expert instruction of Jody Jackson! Please note you will need to bring a travel yoga mat with you on this adventure. Please see the packing list for details and recommendations. Please click here for our Bhutan-specific FAQ. First and foremost, your passport MUST be valid at least 6 months beyond the end date of the trip (that is, April 30, 2018), and you’ll need 5 empty pages in the Visas section of your passport (make sure they are in the Visa section, not the Amendment or Endorsement section). India visa: You will need to arrange an Indian visa before you arrive, and you are eligible for an e-Tourist visa to India (Please click here to make sure your country is eligible for a Visa on Arrival). You can apply for a Visa on Arrival 4 to 120 days in advance of your arrival on this website. Please click here to read our blog about how to apply for this visa. Nepali visa: You will pay for this 15-day visa upon arrival for $25 USD. You do not need to apply beforehand. Bhutan visa: We take care of this for you before you arrive in Bhutan, and the fee is included in your trip. Gluten is also avoidable in our travels by choosing rice over chapatis and other local breads. Celiactravel.com has GREAT printable cards in local languages to present to restaurants and hotels about your intolerance of gluten. Click here for the Hindi version and here for the Nepali version. We will inform your Bhutan guide well in advance of any allergies. If you have multiple dietary needs, it may be worth your while to check out these specialty cards, available in 60 different languages. When you register for the trip, you will answer a set of registration questions, including those about food allergies. We’ll take a look at your answers and let you know if we have any suggestions or concerns. None are required to enter India, Nepal, or Bhutan, but we suggest you work with your physician or your area’s travel health expert to decide what options are best for you. You can read the CDC’s recommendations here. Bhutan’s mountains roads can be very curvy and can induce motion sickness. We recommend bringing Dramamine (Dimenhydrinate) as a precaution (if it is safe for you to do so), or bringing ginger chews/candy and using Sea Bands. Malaria is not a risk in our destinations, but again, we request that you work with your physician or travel doctor when making these choices. Please see our blog about this topic for more information. Please see the separate toggle on this page for that information. At minimum, we recommend that guests feel comfortable walking one mile unassisted and climbing/descending 2 flights of stairs. There are excursions (like Tiger’s Best in Bhutan) which will be more demanding but are entirely optional. That mostly depends on how many “extras” you wish to indulge in (spa treatments, massages, extra activities). The meals not included in India and Nepal will cost anywhere between $5 and $10 depending on your tastes (a bit more if you order at the hotel in Delhi). In Rishikesh, we’ll be staying at a hotel on the west bank of the river, near to Lakshman Jhula. It is simple, clean, has hot water, an attached bathroom with a western toilet and shower, air conditioning, ceiling fan, and wifi. In Kathmandu, we’ll be staying at a guesthouse with a lovely garden and cafe/bakery, that has wifi, hot water, an attached bathroom with a shower and western toilet. In Bhutan, your hotels have hot water, an attached bathroom with a western toilet and shower, wifi, and you can request a heater for your room. I have lived Internationally for 28 years in 7 countries–I would call myself a global adventurer. I currently live in the Middle East and continue to love exploring the world. I studied yoga in Bali and Rishikesh to receive my RYT- 500 hour for Hatha Flow and Ancient Hatha Yoga, with 100 hours in Yoga therapy. My passion for yoga started 9 years ago while living as an International Expat in Malaysia. Previously, I used to source, market, and sell cottage industry goods while living abroad. Another passion of mine was to organize art exhibitions for a famous South East Asian artist. Some of my travels I have previously enjoyed include New Zealand, Australia, Tahiti, Indonesia, Cambodia, Vietnam, Thailand, India, Singapore, Malaysia, China, Japan, Africa, Seychelles, France, Canada, and the USA. 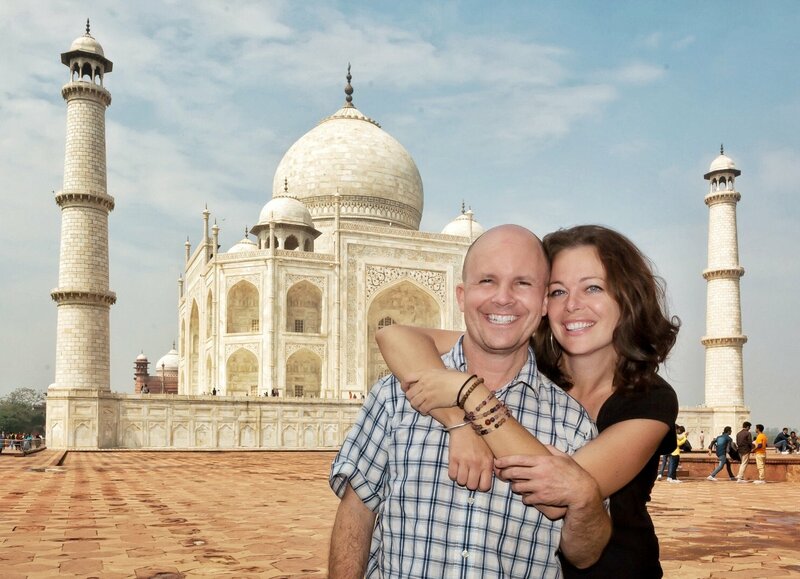 Over the last 15 years, I have spent over 10 weeks in India traveling. I am looking forward to this next Adventure in the Foothills of the Himalayas! Please click a photo to see an enlarged version; you can use your arrow keys or mouse to navigate within the album. All photos have been taken by BJ and Lauren during their travels in these areas.